Xavi has been a fixture in the Barcelona midfield for the last decade. The three-man shortlist for the new FIFA Ballon d’Or award has been announced, and in my mind there is no doubt who should be voted the winner – Xavi. If you look around the world and scan all of the top teams, who can you think of that is more influential during a game of football than the Barcelona and Spain maestro? I can find no-one. I have been blessed with the opportunity to watch, in person, many of the most talented players of the last two decades. The best I ever saw was Zinedine Zidane. The way he could set the tone and control a game was incredible. The ball stuck to his feet as if it were connected by an invisible string. It was magical. The Frenchman knew what he was going to do even before he was given the ball and had an amazing ability to make everyone around him better. The only other footballer I have seen have a similar impact in midfield is Xavi. The 30-year-old has been pulling the strings for Spain and Barcelona for the best part of a decade, and this season he deserves recognition for leading his country to the World Cup title and his club to another league trophy. Xavi has always had a knack for making football look easy. When he burst onto the scene in the 1990s, as an understudy to his current club coach Pep Guardiola at Barcelona, he already showed signs of becoming a star. A few years later, he was given the responsibility of taking over from Pep and becoming Barcelona’s maestro. He hasn’t looked back since and has even been credited with creating Spain’s so called "tiki-taka" - the possession style of football featuring dozens of short passes which eventually tear opponents’ defenses to pieces. It could be easy to overlook the tiny Terrassa native when identifying the stars of Spain and Barcelona over the past year. After all, David Villa was the man who scored most of the goals at the World Cup, and Leo Messi in the league. However, those stars would not have been able to shine as brightly had Xavi not been behind them. In South Africa he completed 89% of his passes and assisted on two of his country’s eight goals in the competition. For Barcelona, he registered over 20 assists as the club swept all before them throughout the season. I remember watching him rip Real Madrid’s defense to pieces in last season’s "Clasico" clash at the Santiago Bernabeu. Two assists for two Messi goals. It’s easy to see the effect he has on Leo. Just have a look at the Argentine’s goalscoring record for club and country - he's unstoppable in a Barca shirt but far less potent for his national team. So as the coaches and captains of 208 national teams vote for this prestigious award along with leading journalists around the world, I hope justice is done and Xavi comes out on top. As good as the other two finalists - Messi and Andres Iniesta - have been, he was by a mile the planet’s best player this year. He deserves it. A crown on his incredible career. i found the list unfair....what happen to arjen robben , the magnificent sneider...he have won every thing and pulled his national team to the final...at least he should be on the short list......but what can we say..i can see more clearly that Fifa is more corrapted and unstabilaized in giving decisions.. I agree, Xavi should be the winner. Messi is the best but this year Xavi has done everything to deserve it, more than Iniesta, another amazing player. Anyway, at the end it will be an award for all of them and their incredible team, FC Barcelona. Xavi is a very good midfielder, no doubt. But like Zinedine Zidane? Come on. Lionel Messi is not only like Zinedine Zidane, he's going to be like Maradona or Pele (sooner than later). Messi is incredible, the best in the world by all accounts. Why Messi,bad national team show!!! Pedro, u r scanning only top teams which is unfair. To me Diego Forlan was miles on top of everybody else. we should look further than Barcelona when we are looking at this issue. Forlan singlehandedly lifted the Europa cup, took Uruguay to the world cup sem final, scored same goals etc etc etc! i wonder what messi, Xavi or Iniesta would do if they were picked to play in other teams outside of Spain and Barca. The footballing world has been unfair to Diego. Sorry Pedro, Xavi is a great mastermind but Messi is at a whole different level. At 23 he is not only shortlisted as the best this year, but also as one of the best ever. Not even Zidane, a phenomenal player, has that honor. They will give it to Xavi because Spain needs another diversion from its horrid economic crisis, but Messi has been the best player in the world for the last 4 years. Sniejder is the man for this award. You know it, we know it, FIFA knows it. But they are too drunken with the wine of corruption and partiality that they'd rather choose someone of similar south American heritage than the person who epitomizes the award. This is a ploy to pass the award to Xavi or Iniesta considering that as long as Messi stays in the team, they'll never taste it's glory. Sniejder was schemed out because with him in the list, such an arrangement would not work out. The three shortlist for this year's FIFA BALLON d'or are no doubt exceptional footballers and individuals.All through the season,all three have held football fans the world over spell bound with great footballing skills both for club and country,with all three contributing massively in BARCA retaining the LA LIGA championship,with Iniesta,and Xavi going one step(massive) ahead of Messi at the world cup in South Afric and emerging world champions. Did Messi fail at the world cup? Personally,I think he had a great world cup,as he was a real threat to all opposing teams.Before the world cup,Messi was in great form in liga,where in emerged champion,just like Iniesta and Xavi.He Won the pinchichi award,and the golden shoe in europe,and not forgetting his wonderful runs and goals haul in season 2009/2010 uefa champs league.He's continued this season where he stopped last season. "don" Xavi,what can one say about this football living legend a la Zadian? Xavi,over the years has been the heart of both club and country.Without the heart how can you breath? Impossible,right....He(Xavi) hardly loose the ball,great ball passer,one that does things(great) with the ball that makes the game look easy,but intresting,and to add a great personality. Iniesta,the world cup hero! Great passer and holder of the ball.Can shake off opponent with ease. All three are exceptional payers with great attitude,and deserving winners,but one must emerge winner.As a Barca fan,and faithful(17 years) I'm proud that these guys are the front runners,I'm proud that we have the record of producing the highest number of fifa's world player.....and once again any of Messi,Iniesta,and Xavi will emerge winner any time soon. It will be a close one between Messi and Xavi.I think Messi might just claim it.Whoever emerges,FC BARCELONA will sure remain winners. "mes que un club," more than a club,we are just more than a club,we are BARCELONA,and we personify good football.BARCA! BARCA!! To me, Xavi is probably one of the best, if not the best, midfielder in history. Definitely surpassing Zidane. I vote for Xavi! Visca Barca!! This is a pathetic shortlist.. The player of the year has to be Wesley Sniejder... Fifa is totally losing it now..
Zlatan Ibrahimovic is the best fotoballer in the world! Who is Messi?Messi cannot play in any team except Barcelona.We saw it in last world cup not even a single goal.Discrimination will never come to an end.Diego forlan was the best player during world cup and befor world cup.Wher is forlan?Where is Samuel Eto.Can any of those above mentioned players messi,xavi.iniesta played defense like Eto did last year?A good player must be an all rounder not just playing in a club with good players.Messi should change club and let see if he gonna win trophy. It's a shame that they do not value Sneijder for his effort the last year. Pep has said it when he saw xavi played in youth team, he knew this kid was going to replace him but then he saw iniesta he knew that this kid would put xavi and pep himself out of the job. I'll go for iniesta, for scoring in a crucial match and for got a lot of foul on him both in barca and Spain and that always gave his team a ball possession.. Winner of the Champions League, Champion of Italia, Winner of the Italian Cup, WC finalist....FORZA Sneijder!!!!!!!!! Maybe Xavi as best in the world right now, but there's no question the finest player to ever take the field is Paul Scholes. XAVI deserves it.Messi is a great player,but sometimes,the race isnot always for the swift. Quite frankly who cares? Its totally subjective any way. What about goalkeepers? Its just another award to massage some footballers ego. They should get rid of this award altogether. I totally agree. Xavi deserves this more than ever. Messi can win again next year but Xavi has done more than enough to deserve this prize. I am a great fan of BARCELONA F.C. and so also three of these great footballers are my favorites. All three of them deserves the CROWN but I would vote for Xavi – his midfield is one of the ALL TIME BEST in the FIFA WC 2010 win by Spain. Some are good players of the ball and others are good with the ball and are so called thinking players, I call them football technicians. Michael Laudrup was the best football technician, I ever saw in last 25 years. I'm just in love with Inista and Xavi and to me any of this two deserves the award. Believe me, these two are the engine power house for both their club and national teams. I give to the two, they can be co-winners. i love the selection. but i ll love xavi to take the price. he is a great player. Sneijder is clearly the one that is missing from the shortlist. Like I'm not saying he should win but he deserves to be up there since he made Inter win the National league, the National Cup, The Champions league and he got the Dutch team to the finals. Think him missing shows what conservatism, commercialization, corruption and friend politics have done to the FIFA. Really think the FIFA needs some sort of agencies controlling it's vast financial income. Not to mention the conservative attitude towards technical aides for the Ref. For all those routing for Sniejder, really???!!! I bet you also voted for Cannavaro which was a complete travesty. Sniejder was booted out of Real Madrid and ended up in Inter. If any Inter player should get the prize it would have to be Samuel Etoo as he has won considerably more than Sneijder in recent times. There are only two contenders, Xavi and Messi and frankly Xavi not only won the 6 titles in 2009 and the same tournaments as Messi but also the World Cup. Messi is fantastic but Xavi deserves this prize. A fantastic footballer and person. Unpretentious and humble (like Messi). Lee Chung Yong from Bolton is the Best yeah!!! Please vote for him... I Beg YOU! He Is SUPER soccer player!yeah! FOREVER!!!!! Finally, someone who agrees with me. While Messi is great, he is by no means the best player (or even winger) in the world. He is so dominant with Barca because of Xavi. Just look at how little effect Messi had in the World Cup, when he was without Xavi. Xavi truly deserves this award because of how much he and his teams have accomplished this year, and he has been at the center of it all. Messi gets all the press because he is the one who scores the goals only after Xavi does the work of setting him up. I would be very disappointed in FIFA if they give the award to Messi. To be honest, I feel like Messi shouldn't be on this list. Someone like Wesley Sneijder deserves it more. He was at the World Cup final too, and won the Champion's League and Serie A in Italy this year with Internazionale (neither of which Messi has ever accomplished). I think Thomas Müller of Germany should have been nominated for this award if one looks at his performance in the last World Cup and at Bayern Munich last season. Xavi was the genious who masterminded World cup win for Spain. So he deserves to be the top player of 2010. Xavi is very good and also in holding the ball and passes too, but coming to leo messi he is unstopable and incridible real lion when he is with the ball. so i view it as messi the second time, always be there when expect and needed him. given the passes to players is the all , what matters is what did u do with the passes the finisher , so messi always dose wonders with the ball when it comes to him by scoring amazing goals. Go Messi for the best. For me there is one man that fifa has not been fair to and that is wesly snerder of inter. I think he should be part of the last three. Messi is great; but he could not make Argentina win alone. Just like Xavi and Iniesta – its a team work! He has played exceptionally well at world cup, supplying brilliant passes for Tervez to score; just like Xavi. The trio is brilliant, but Messi is phenomenal and exceptionally gifted. He can dribble any number of diffenders, control the ball and scores. The world cup final you are making a lot of noise about, was not that fantastic to carry so much weight. Why then about Diego Follan win the Gold Boots over the Spaniards? Messi is a cut above the rest – though his two team mates are very good! Who can be compared to Messi for now? Lets face fact who? THE HONOUR GOES TO PLAYERS WITH VERY EXCEPTIONAL QUALITIES, U ALL MUST KNOW THIS. WOW! This is a testament of beautiful football as it provides players wit the opportunity to showcase individual talent and brilliance. EPL is wrestling with the ball!!!! 69 games played. And gues what? 69 goals scored. Xavi ,Iniesta and Forlán are the BEST FOOTBALLERS IN THE WHOLE WORLD NOW! But I hope the trophy goes to XAVI HERNANDEZ! Andres Iniesta is the best footballer in the world! Xavi and Iniesta are grate players no doubt about that but Messi his wonderful and he can do amazing things with the ball... Spain only mangaed to score one goal in most of their games at world cup simply because there was no one that can make use of Xavi pass like Messi. We all see him agaist Real madrid. 46 goals in a sesaon s not easy Man!!!!!!! Anyway, I'm a Barcelona fan. so I'm happy with three of them. who ever win it deserve to be crown..
What about SCHNEIDER & ROBBEN??? Is it all spanish now, or have we forgotton that there other excellent players? those three are definately up there but if you tell me that,someone that won the champions league(that most europeans supposedly see is far beta than a world cup final),the scudetto and the italian FA cup,even spearhead the dutch to world cup final not among the top three,then there's sometime wrong.however,personally i think iniesta should b the world player,guess he may neva get recognise cos of his qiet and humble nature.messi is good but...what about forlan europa league and the world cup with such as weak team. I think the question we should ask is: What makes a player the best? Is it skills or influence on a team? Messi is no doubt the most talented player I've ever seen. Surpassing Maradona and the rest. But i think Xavi deserves to win it this year. Not just for winning everything, but for his contribution to the game of football. for being consistent for as long as i can remember. its a joy to watch him play. Synejder, forlan, ibra are no where near this league. Xavi's as good a candidate as anyone for the title. But who cares? World Player of the year in a team sport makes no sense. 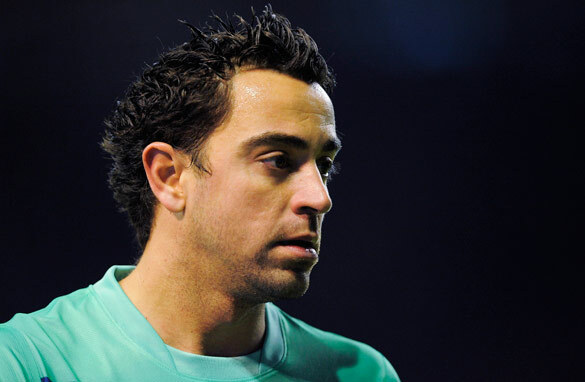 Can Xavi play right back or in goal? Even a collective team of the year award doesn't make sense as the voters are no position to judge the effectiveness of individuals over the whole season. Now club team of the year would be a valid award, and Xavi wouldn't be in it this year as that team was clearly Inter. Iniesta is my choice for the award,considering his winning goal at the world cup final.However,Messi and Xavi have also done incredible job for Barcelona last season. I think openly and truly that Xavi is just the best in dat list, he has been the main mastermind behind Barcelona success. So i go for the magnificent Xavi! FIFA again, what is the cirteria fro the selections? if it is world cup messi not qualified, if it is champions leaque, messi not qualified, if it is copa america, messi not qualified cus he won non of the above competition, so which is the new cirteria now for the selection. We all know Barcelona is the best team in the world with Messi, Xavi and ineista much like how the chicago bulls were of the 90s with Michael jordan, scottiie pippen and horace grant. But pound for pound, on any given day, playing for any team in the world, it cannot be determined who is the best footballer as they have not played in another team or coached another team. Which brings us to the obvious truth, mourinho is the worls best coach and cristiano ronaldo the worlds best player because they have teams from inception and make winners out of team. No one could say otherwise because the facts are undeniable. Without them to beat on that 5-0 trashing, the Barcelona guys are very good at best but the best of the best, in my books, are the ones who suffer defeat and rise again like Mohammed Ali. If these guys can stand up and be counted like this then they will earn my respect. As far as it goes, they will always be barcelona boys and not real men. everybody know the three of them are very good player, but for this year award, xavi what it in short.. I preffer XAVI he the man to watch, he's an outstanding player that any fan could love to watch while on the pitch. Great piece! (as usual) Couldn't agree more, Xavi is the best! I'm just glad they nominated all Barca players. There isn't a better club in the world right now. Good piece, Pinto...especially on Zidane whom i consider the greatest player ever. Before FIFA chose the barcelona trio, i'd already choosen Xavi and Iniesta. This is a world cup year, and both won the world cup for spain. So either of the two deserves it. Xavi is the best. It is time we value the mid fielders! No doubt Messi and Iniesta have talent but Xavi is the more valuable for a team performance. Definetely Messi..no doubt about it. He is phenomenal. The fact that he is a part of national team that was pathetic at the world cup due in part to the head coach should not influence this. Yes Spain won the world cup and yes Barcelona would not be the same without Xavi but Messi is in a different league of his own. The best footballers I ever saw were Ronaldinho and JayJay Okocha. You can bear with me that these two superstars not only played for money but they entertained. They made football the most beautiful game. Xavi, Iniesta and Messi are all fine ballers but they don't have the talent of two football magicians I have mentioned earlier. That is why they are my best heroes of all time. But not to annoy the bootlickers of those fine men of Barca, I can say that Xavi could be honoured with that title if not Messi. I suppose the author of this article has only been watching La Liga and FIFA. How about Thomas Muller? Maybe the author hasn't watched Premier League and Bundesliga. He is some kind of biased though. Pedro Pinto, just a fantastic article. i´m a barca suporter and a football lover. For those who don´t think Xavi should won just take a look at any match he plays, just marvelous, doesn´t miss a ball, seems football to be easy, and thats the most dificult thing to do. Let´s enjoy this barca because probably will be a historic team. Just for real football lovers. Personally I have never seen a team playing like this.. 70 % of ball posession, makes the other team go behind shadows (spanish expression). But... Barca y more than a single player, look at Iniesta,Messi, Piqué, Abidal, Alves, etc, etc these playes enjoy playing in barca and not all players enjoy playing in their teams and that is something that can´t be paid for us. Thanks Pep, thanks Johan!! Kids, Zidane is the best football player in history, no pele, no maradona. NO ONE CAN BE COMPARED TO THE KING!!!!!!!!!!!!!!!!!!!!!!!! have we forgotten about ronaldo? Messii is the best !!! This gotta be a joke. Where the hell is Sneijder? Barcelona... money won again! Frank, who's Messi ?, where have you been ?, any way I will be happy for any of the 3, they are all far from the rest. I don't mind if Xavi wins it, but the fact is that Messi is the best. Just think of it this way: you've just been handed a magic wand and with it you are allowed to take any player in the world and put them on your team for 1 year. Who do you take? I'd be surprised if less than 90% chose Messi. You're right that Xavi is one of the best in the last 5 years but not in the last season 2009/2010. The most influintial player to his team is Wesley Sneijder. He led his team to win three champions as well as his national team to the final. Maybe he is not the best but surely he benefited his team to a great achievement. I heared about Maradona and Pele. But i never saw them playing in real time match i was thinking how these legends would be looked or felt by people. Say how the legends look like. When i saw Messi playing, now i say the legends are like Messi. This is a great, however short, list of players but one thing bothers me; I can't believe that Diego Forlan was not nominated. Not only has he helped Atletico Madrid immensely, but it can be argued that he carried Uruguay on his back throughout the entire World Cup. I think that he should win his honor, or at the very least, he should have been nominated. 69 goals! what are you guys thinking about? if xavi was from another country then not too many people would be voting for him! Messi is the only one that shuold win this! forgot to ask, is Pedro from Spain? Sorry but this short list it's ridiculous . What about the Big talent Sneijder ? He had thoroughly deserved to be in this list.He indeed must be the winner of the Balon d'Or. He bring his team FC Inter to win the European Champions League, Italian League and Italian Cup . He together with Robben bring Holland national team scoring four goals to final of the World Cup . All this in the same year playing an eccellent football .Last season Messi has won what? No champions leauge , out in World Cup playing really bad.Big talent but not enough to win or to be this year in the short list . The Balon d'Or is awarded always for those who have done an excellent season and won cups with his teams .Something strange happened this year. Shame on who prepared this short list. well written article.Xavi truly deserve this award for his true creativity and inspiration when he is on the field. Diego Forlan is the best!!! Xavi looks good for the prestigious award. Others are not far behind. Their time will certainly come. Who knows when ? May be the hour has come. I'll wait and watch. Best wishes. What did Messi win last season. No UEFA trophy and was humiliated in the world cup. Make your selection fairly and stop making something out of nothing. Give the opportunity to every player. messi is the worlds best footballer. That Xavi deserves the award is in no doubt. Great player, playing for a great team (Barcelona). I cannot speak of comparing him to Zidane, simply because I quite never saw Zidane playing per-se. I would however prefer to have an award for the best team in the world as opposed to the best player, because an individual player never won a sccer match. Of course, such an award would curently go to Barcelona. Nevertheless, congratulations to Xavi for a job well done. Xavi is the best among the three. A striker is useless without a good and resilient feeder (midfielder). Xavi has proved to be very effective both at club level and national level. My vote goes to him. forlan and sneijder should have been there. fifa is becoming a joke this is not popularity contest, it avbout a player did during the season and theses players did better than the most esp messi. NO XAVI NO MESSI,MESSI NEEDS PLAYERS LIKE XAVI TO SHINE .INIESTA IS GOOD BUT XAVI DESERVES TO BE THE WORLDS BEST PLAYER. I think the Barcelona trio deserve the recognition. Messi is indeed the best player in the whole world, but Xavi has remained consistant in his performance since the world cup so, it is understandable why he is considered the favorite for the ballon d Or. I have repeatedly read people comments that Messi can not play any where else except in Spain and with Barcelona. That is an unfair thought for anyone to harbor. It is common knowlegde that a footballer's performance on his national team is different from that of his club. That is for obvious reasons. Team spirit, Unity, coordination and understanding are basic factors which usually impacts a players performance in a game. So there is no way messi can be blamed for not scoring a goal for his country at the 2010 world Cup. There were several lapses in the Argentine team which were visible for all to see. However, a victory for either of the FC Barcelona players is a boost not only to the club but the La liga as the best league in the world. hey guys i think Messi is da best dis guy plays 7 star football. Xavi is the best I but the list needs help. Robben Should be there also Sneijder. Both Dutch men Was impressive for both club And Country. Messi did nothing for his country without Xavi and Andres to help. iniesta is the man, messi is good but i ´have a feeling he cant play in another team. a midfield with xavi and iniesta,any good player should do well. C.Ronaldo has proved he can play any where,in England he made record now in spain he is still soaring in goals. Messi should move to a different clud and lets see if he will still remain the Messi he is now. A good example was the last world cup. YA xavi won the world cup but not to forget that spain won because of class player all over the pitch and even in the bench.Not only because of xavi.To win world cup one need a good combination not the great player alone.So every credit should not go to xavi.Looking at the performance of lionel messi last season even in this season he simply outstanding one cant imagine barcelona dominance in the absence of messi even there is xavi or inestia so me its messi deserve to win because players play world cup in every 4 years where as they are involed in club game in almost each and every day.So this perfomance should be taken as base for the selection rather than world cup.If award is given according to the performance of world cupo clearly with no doubt its Wesley Sneijder . Concerning the world footballer of the year issue, is nice to see Xavi, Iniesta and Messi been shortlisted for the trophy, what happen to Diego Foland, Arjen Robben, David Villa and other players that performed excellently in the world, why has fifa choose to merge the world player trophy to the European trophy together, is this a new development from fifa? I think that Ibrahim Afellay is the best player on this moment. World football of the year is an annual award. Since it has some criteria of given the award in every world cup year, I think Iniesta who scored the wiining goal of the final or Xavi who was behind all the passes should be given the award. Messi was sensational in La Liga but failed at the WC as well. Iniesta was fantastic in both so that's why he got my vote. Much ado about Wesley Sneijder. He's good player no doubt, but I do believe the award does not celebrate only achievements. Yes, Sneijder won the champions league, but Diego Milito's brilliance afforded Inter the victory. Sneijder was in the World cup final and failed to lift his team against the Spaniards. Take a Messi out of Barcelona and they score less goals, take an Iniesta and a Xavi out of Barcelona and there is a midfield lack. I will not fault FIFA's selection as they chose players with both excellent individual and team play. Personally, I'd pick Lionel Messi for the award. He had an excellent season up front for Barcelona, and played and excellent midfield role for Argentina at the World Cup. dudes i think Messi the lion should win it. Messi is a grat footballer. True Xavi and inesta are great but they have off days too. And messi when he has an off day, instead of scoring goals he creates them and sets them up for some one else like in el classico. He is not like some arrogant selfish spoilt child. Guess u understood who i am talking about. SINCERELY, MESSI AND XAVI COULD BE BEST BET, BUT MY OBSERVATION IS THAT, WHILST XAVI AID BOTH GOOD WITH CLUB AND COUNTRY, MESSI SEEMS NOT TO BE TOO GOOD WITH THE COUNTRY. SO XAVI IS A BIT ABOVE MESSI FOR NOW. Xavi is absolutely superb he deserve to be called the best. I think that Xavi will take a second place,becouse Lionel Messi is on top of his form! He plays very all last 2 years... So 100% winner is Messi. I Think barcelona all players deserve this award... coz everyone give they more than 100% on pitch ... but xavi the maestro is amazing.. inesta the part of xavi & messi from the another world ..
Thierry henry was denied in 2003. 2010 Messi is the man but i think Wesley sneider shud have been in third place instead of Andres Iniesta. The real award shud be in this format. Take this message to FIFA, Iniesta's name shud be removed and replaced by Wesley Sneider or Samuel Eto'o not Iniesta. You are probably right with your analysis. For me, he should win World Best because of the world cup....otherwise a certain Messi is undoubtedly the most gitfed player now. I am from PORT HARCOURT, NIGERIA i wish to observed that, the next world best footballer should be given to Iniesta lujan, instead of messi, reasons are, single handedly he scored the only, and most important GOAL in the final match; between Spain and Netherland. For this reason I think he deserve the award of becoming the world best player in 2010/11 season. To all those that talk about Messi, Iniesta and Xavi, they all had a good 2010 but Schneider had an AMAZING 2010. If that is not enough i do not know what is. And Stephan (7th Dec) clearly said, Xavi and Messi won 6 trophies in 2009. This is 2010 and Sjneider has 5! So if you want to give a trophy to Xavi for consistency then go ahead, but the BEST player of 2010 is without doubt Wesley Snjeider! I know Pedro, you are a Portuguese and you have a always been un- rational supporter of Rolando, now the reason you are giving your support for Xavi is not because you honestly believe that Xavi is the best, but because you can not help it watching the actual best player, messi, being crowned the trophies. I have been closely following your articles and you never have written yet any good one. I think no one takes you seriously. Xavi. If Messi is the Messiah, Xavi is Mary, Mother of God. A beauty to watch – apart from the wonderful passes, I particularly adore the "xavi turn", when in the very middle of the field he waits for a player to come close to his back and then turns 360 degrees leaving the player behind him. It would be unfair were he not to win. I think it is much more interesting to find out why FIFA didnt include votes from over 70 countries in the recent vote. Countries like Ireland, Norway, Denmark and Nigeria all filled their votes but they werent counted according to offical FIFA documents (Which I have a copy off and can be found on FIFA's own website). Both Ireland and Denmark's football associations have demanded a full enquiry.